If you use a dipole antenna and you want to connect it to an older FM receiver which has 200-300 ohms impedance and balanced input, you can use twin lead cable and wire the antenna directly to the receiver. As opposed to coaxial cable, the twin lead cable has no shielding and the signal can be affected by other RF sources. Another option would be to use a coaxial cable with baluns at both ends. The baluns add signal loss, therefore a receiving amplifier may be a good idea. The other situation when you don't have to use a balun is when you connect an unbalanced antenna to an unbalanced signal input (or output). 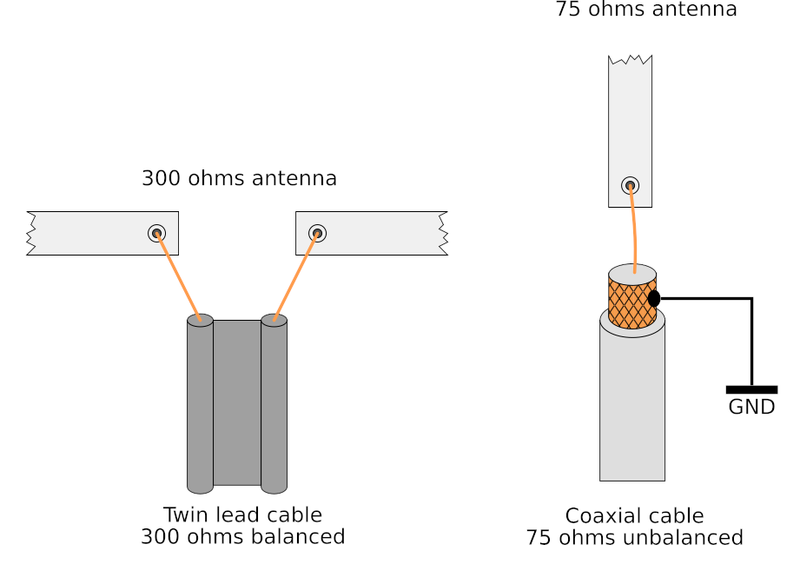 An example of unbalanced antenna is the popular whip antenna, to which you can connect the centre copper wire of a coaxial cable. The cable shield would then connect to the antenna ground. The disadvantage is that there is not always a perfect impedance matching, because quarter wave whip antenna impedance varies with frequency (it is lowest at resonant frequency). Here are the two situations where you don't need a balun. On the left is the twin lead cable connected to a dipole (both have 200-300 ohms impedance) and on the right is the coaxial cable connected to a whip antenna or similar type (where both have 50-75 ohms impedance). 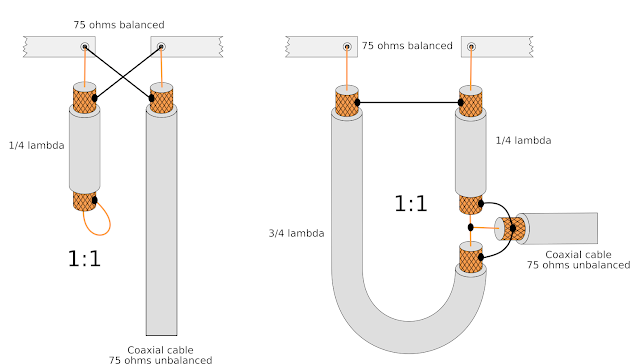 This is the most common setup where you connect the poles of a dipole to a coaxial cable. They can't be connected directly because one is balanced and the other in unbalanced and there is also impedance mismatch. 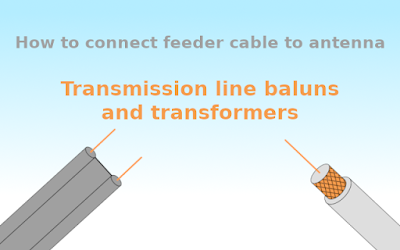 The balun is built using a half wavelength piece of coaxial cable. The cable length is however proportionally shorter than 1/2 wavelength (see below how to calculate length for frequency). This 4:1 balun can be used as well for 300 to 75 ohms matching, but also for 200 to 50 ohms. The centre cores of the half wavelength piece of cable connect to the terminals of the dipole. 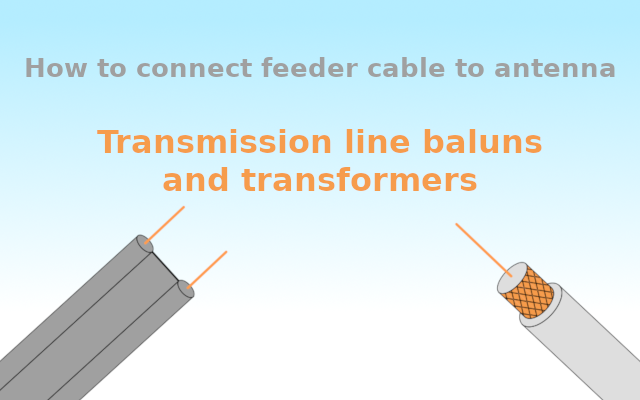 The feeder cable centre connects to one of the terminals of the dipole (it doesn't matter which one). The ground shields from all cable ends connect together. In this case, input impedance equals the output impedance. The balun matches a balanced signal to an unbalanced one. While dipoles don't usually have 75 ohms impedance, this kind of balun can be used for arrays of 4 dipole antennas that are wired in parallel using twin lead cable. There are two types of 1:1 baluns. 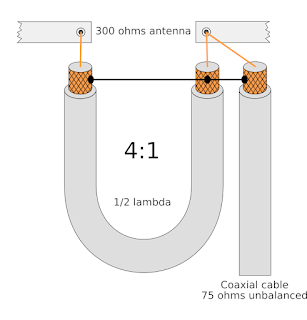 The left one uses only a piece of quarter wavelength cable while the second one need an additional piece of 3-quarters wavelength coaxial cable. Connections are made as you see in the illustration above. The design on the right is also known as Quarter/Three-Quarter Wave (Q3Q) balun and has very little loss at a bandwidth of about 10%. The baluns above use pieces of coaxial cable that are 1/4, 1/2 and 3/4 wavelength. It should be noted that the length of a coaxial wire is the shield length. The baluns presented here are not wideband. You need to know the frequency they will work on. If you build one of these for a TV antenna find on what frequency is broadcasting the station you are interested in. You can look up the channel number in a frequency table, like this one on Wikipedia. The wavelength, in millimeters, can be calculated by dividing the speed of light (in km/s) by frequency (in MHz). Then, you may apply a correction factor, which for coaxial cable is 0.66 (proportional to the dielectric constant of the polyethylene insulator used at coaxial cables). The use of velocity factor is disputed (see experiments of John Huggings). A practical example of calculation would be: let's assume we need the cable length for a receiving installation on channel 32 UHF. The center frequency is 562 MHz. Then, the wavelength is 300000/562 = 533.8 mm. Apply 0.66 velocity factor to this and you get 533.8 * 0.66 = 352.31 mm. Now 1/2 lambda length is 176 mm, 1/4 lambda length is 88 mm and 3/4 lambda length is 264 mm. M. Bășoiu, N. Neguț. Antene și montaje de recepție TV, 1989 (pg. 3-5). ISBN 973-31-0148-6. ARRL Inc. Baluns and Transmission-Line Transformers in The ARRL 2015 Handbook for Radio Communications, 2015, pg. 751, 766. ISBN 978-1-62595-020-8. Wikipedia contributors. "Balun." Wikipedia, The Free Encyclopedia. Wikipedia, The Free Encyclopedia, 7 Apr. 2018. Web. 12 Apr. 2018. Wikipedia contributors. "Dipole antenna." Wikipedia, The Free Encyclopedia. Wikipedia, The Free Encyclopedia, 5 Apr. 2018. Web. 12 Apr. 2018. Wikipedia contributors. "Whip antenna." Wikipedia, The Free Encyclopedia. Wikipedia, The Free Encyclopedia, 26 Jan. 2018. Web. 12 Apr. 2018. Ian Poole, Radio-Electronics.com. Antenna Resonance & Bandwidth (accessed 12 Apr, 2018). John Huggings. 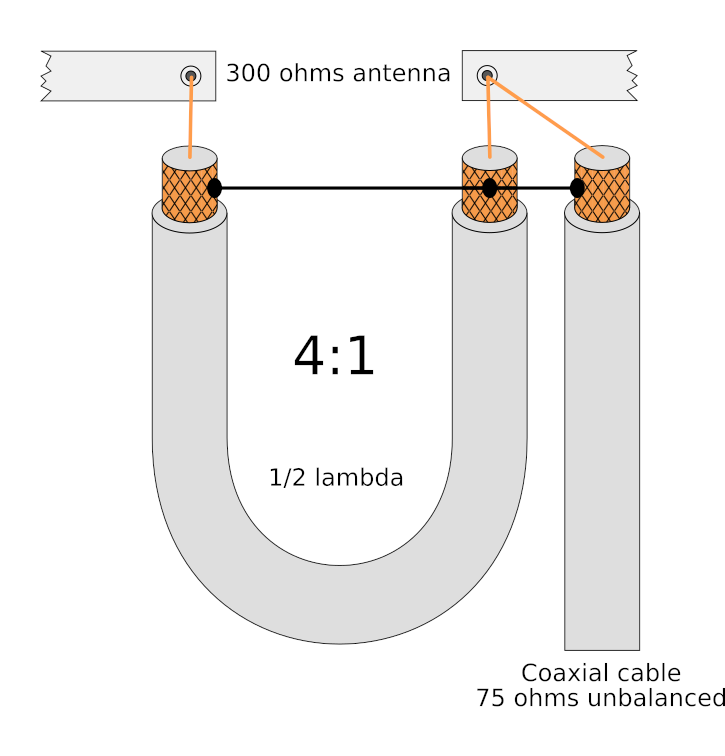 Coax Velocity Factor in Baluns, Does it Matter? (accessed 12 Apr, 2018).